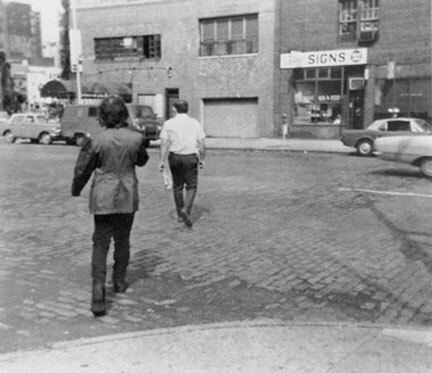 Read Creative Loafing's article on "Vito Acconci: Open to You"
Watch Vito Acconci's video "Theme Song"
In 1969, Vito Hannibal Acconci, an experimental poet living in New York, made a radical shift in his art. His concept of poetry was as much visual as verbal – he used the space of a blank page for words and letters the way a painter would use a canvas for paint. Suddenly, he realized that he could use the space of New York City as a performer in the same way he used a blank piece of paper as a poet. Thus began one of the most unusual, prolific and admired bodies of work in all of twentieth century art. In the next half-decade, Acconci produced a staggering number of performances – in galleries, in the streets or all alone, using his own body and its limitations as a basis. On the occasion of the artist’s seventieth birthday, Film Love presents four of Acconci’s classic performance videos. Comic and serious in equal measure, conceptually brilliant, and running the emotional gauntlet from hilarious to touching to disturbing, these memorable and influential works helped establish new ways of creating art in America. Acconci’s art is all about relationships: between self and other, self and environment, man and woman, public and private, vulnerability and control, between opening up and closing off, between I and You. Acconci’s performances are marked by his intense but highly engaging personality – his deadpan face, distinctive gravelly voice, comic timing, and brilliant use of language. In addition, the videos document the heroic (and often risky) mental and physical extremes to which Acconci went in order to fully explore the profound philosophical, existential, and psychological issues raised by his ideas. At the screening, curator Andy Ditzler will provide an introduction to the videos and to Acconci’s work.